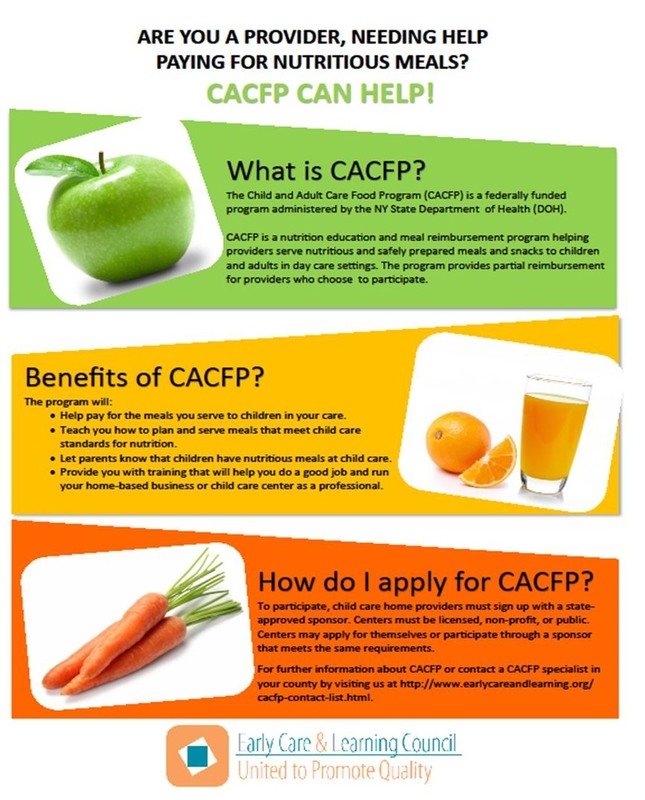 (CACFP) is a federal program which reimburses child care providers for serving meals and snacks which meet the USDA guidelines to the children in their care. All licensed, registered, and legally exempt child care providers are eligible to participate in CACFP. Child care providers who choose to be a part of the CACFP program provide meals and snacks which meet USDA guidelines to all the children in their child care. Providers keep daily menu and attendance records and submit them to their CACFP food program sponsor at the end of each month. Participants must also attend 1 free nutrition training each year. Each month participants will receive a check based on the number of meals and snacks served. You can be reimbursed for a maximum of two meals and one snack or two snacks and one meal per day. There are two rates of reimbursement, the Tier 1 rate is for providers who are in a low income area or household, and theTtier 2 rate is for everyone else. • Parents don't have to worry about the cost and the time involved with preparing meals for their children while they are in child care. • CACFP helps encourage children to eat better because of the healthy foods they are served. • CACFP will reimburse you for the meals and snacks that you provide to children enrolled in your child care program. • CACFP sponsors will provide training and support in nutrition, feeding children, buying and cooking food. • Your own children may be claimed if your household is eligible. • You can let parents know that you provide healthy foods that meet CACFP guidelines. The St. Lawrence Child Care Council is not a CACFP Sponsor agency. We have a strong working relationship with two CACFP Sponsor agencies who have been serving St. Lawrence County providers for decades. Establishing our own program is not a consideration at this time and we refer all providers to both programs. Providers choose which sponsor agency is best for their program and location. National Food Service Management Services OnLine CACFP Classes. Here you will find online courses that you can use to learn more about the Child and Adult Care Food Program (CACFP) and providing quality care for the children in your program. Take advantage of the following Child Care Online Courses that prepare child care providers to meet the challenges of the day to day operations of child care programs. Remember to check with your sponsor or state agency for the most up-to-date information. These classes provide valuable information; however they do not count toward training hours for registration and licensing purposes.